Hawaii is the 50th and last state admitted into the union. But when it comes to beauty, Hawaii ranks far from last. Mark Twain once called it “the most beautiful anchored in any ocean”. Known as the “Aloha State”, Hawaii is comprised of eight major islands. Only seven of the total islands are inhabited while the eighth, Kahoolawe, was used for live fire bombing practice by the U.S. navy until 1990 but is now an island reserve whose waters are used for cultural and spiritual purposes. In total, however, the Hawaiian archipelago consists of 137 islands, islets, and atolls. The largest of the islands in Hawaii is often called the “Big Island”, although its official name is “Hawaii”. The Big Island is twice the size of all the other islands combined, measuring 4,050 square miles. It has a national park, two active volcanoes, and two mountain peaks that are more than 13,000 feet above sea level. The second largest Hawaiian island is Maui, where the state’s most beautiful beaches are found. Maui is also home to several resort areas, a restored whaling port, and the enormous yet colorful dormant crater known as Haleakala. 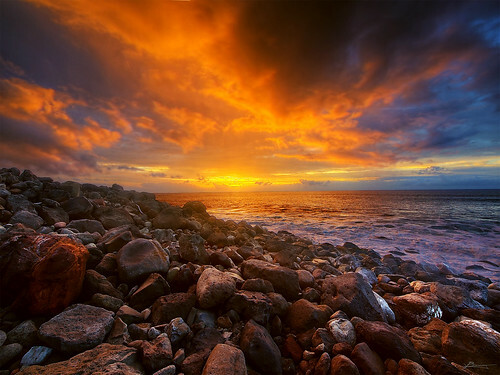 West and northwest of Maui, there are two quiet islands called Lanai and Molokai. Both are quiet and relatively undeveloped, but still boast resorts and golf courses that attract visitors. Oahu is the third largest Hawaiian island, but the most popular among tourists. It is home to the state’s capital and largest city, Honolulu, which is where famous landmarks such as Pearl Harbor, Diamond Head, and Waikiki are located. Kauai and Niihau are the two westernmost islands of Hawaii. In 1992, a hurricane destroyed lush Kauai, including its famed Garden Isle. Today, the roosters and hens that run around the island are said to have been let loose when the hurricane destroyed a chicken farm. Unlike other islands, Niihau is privately owned and may be viewed only by helicopter or through a limited supervised tour. Beyond Niihau, there are a string of tiny islets and atolls that stretch for miles. Collectively, they are known as the Northwestern Hawaiian Islands. The only marks of habitation on these islands are wildlife facilities and military installations, including one on Midway. Most anywhere you go in Hawaii, you’re mostly likely standing on top of a volcano. The Hawaiian Islands were formed eons ago from volcanic activity, which began at the northwest end of the Leeward Islands. This chain of islands is somewhere between five to ten million years old. The main Hawaiian islands are much younger, estimated between one to five million years old. Today, volcanic activity persists on the Big Island. The story told by locals is that the goddess of fire, Pele, traveled from island to island in search of a home, and finally decided to settle down in Hawaii. Hawaii’s most popular volcano is Kilauea, which is known as the nation’s “drive-in volcano”. Located in Hawaii Volcanoes National Park, Kilauea billows smokes and belches fire and rock intermittently. If you visit the park, be sure to view Madam Pele’s handiwork. The Mauna Loa, on the other hand, is much quieter. It last erupted in 1984 when it sent molten lava streams down its slopes. By comparison, though, the mighty Haleakala in Maui has not erupted the last 200 years. Hawaii is a water world of fun, ideal for swimming, surfing, scuba diving, snorkeling, windsurfing, and boating. Even if you aren’t much of a water sports enthusiast, getting toasted on a beach or dipping your toes to test the ocean’s temperature is a great way to pass time. The sea is impossible to escape in Hawaii. In the early morning, the surf splashes against the shores and in the late-evening the sun paints a nice hue on the waves. The sea definitely blends with the land, making Hawaii a great vacation destination. At the Polynesian Cultural Center, you’ll find a showcase of the South Seas cultures represented in the South Pacific islands. Other cultural sights include Oahu’s Plantation Village, Kauai’s Grove Farm Homestead, and Maui’s Alexander & Baldwin Sugar Museum, which gives visitors a peek into the sugar plantation era. There are also numerous Chinese markets, Filipino restaurants, and tours of Japanese shrines. And while whalers and missionaries are long gone, you can retrace their steps in a walk through Lahaina, Maui. Polynesians from the Marquesas landed in Hawaii as early as 6th century AD. About 500 years later, they were joined by more Polynesians from Tahiti. These people crossed the uncharted Pacific in large sailing canoes with their families, animals, personal belongings, and plants, and landed in Hawaii. For centuries, the Polynesians lived only a Stone Age life, living in grass houses, traveling around in outrigger canoes, and making tapa cloth and carvings. They ate fish, poi, and other fruits found on the islands. In 1778, British explorer Captain James Cook discovered the islands during the last of his South Pacific voyages. He found separate feudal kingdoms organized according to chiefs, priests, and commoners. By 1810, King Kamehameha, ruler of the Hawaii Island, had managed to bring all the islands under his control. His dynasty, which included his descendants, lasted until 1872. Rulers from another ancient family of chiefs led by Queen Liliuokalani took over. Their monarchy ruled until they were overturned in 1893 and replaced by a provisional government. Many immigrants came during the 19th century and rearranged Hawaiian society. Captain Cook was followed by numerous traders and whalers who were beached and seeking provisions and entertainment. Beginning in 1820, several missionaries joined the wave. Stern New Englanders made the dangerous trek to the mid-Pacific to convert the natives to Christianity. They also introduced commerce, plantation agriculture, and democracy. Many of their descendants remain prominent figures today in the islands. In the late 19th century, the Chinese, Japanese, Portuguese, and later the Filipinos joined to work the pineapple and sugarcane plantations. On July 4, 1894, the Republic of Hawaii was formed on July 4, 1894 and Sanford B. Dole was made its president. Four years later, the United States annexed Hawaii and subsequently made it a territory in 1900. Dole was appointed the territory’s governor while the nephew of Queen Liliuokalani, Prince Kuhio, became one of its first Congressional delegates. Prince Kuhio fought tirelessly for the rights of native Hawaiians and introduced the first Hawaiian statehood bill in 1919. From the early 20th century until WWII, the pineapple and sugar plantations prospered. The success of the two industries attracted a large number of immigrants who came to work the vast holdings. The military soon became interested in the islands. In 1908, Congress approved the funding of a large naval base at Pearl Harbor, which became the scene of the bombing on December 7, 1941 that lured the U.S. into war. Even though Hawaii is quite a distance away, its statehood was approved when Alaska joined the Union in January, 1959. A couple of months later, Congress passed a bill that made Hawaii the 50th state, ending a half-century campaign waged by the locals. Today, Hawaii is home to about 1.2 million people and welcomes more than 7 million visitors every year. Braasch, Barbara J., and David E. Clark. Hawaii: A Guide to All the Islands. Menlo Park: Sunset Publishing Corporation, 1993. ISBN: 0376063106.